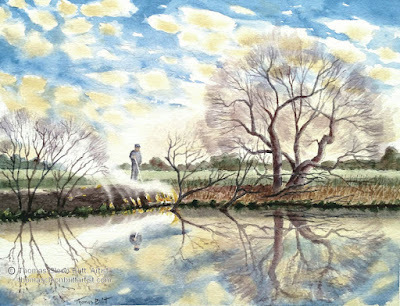 This is my father, TK Britt, burning the pond bank, painted from my 1989 pencil sketch. The pond was built by my father, grandfather, uncles, and others, and became a busy community gathering place for folks of all ages, on Sunday afternoons from around 1954 until about 1970. The bream fishing was very dependable. THOMAS CLEON BRITT is a watercolorist who lives and paints in Wilmington, NC. His art is informed by his experiences of living, working, and playing in the Carolinas. 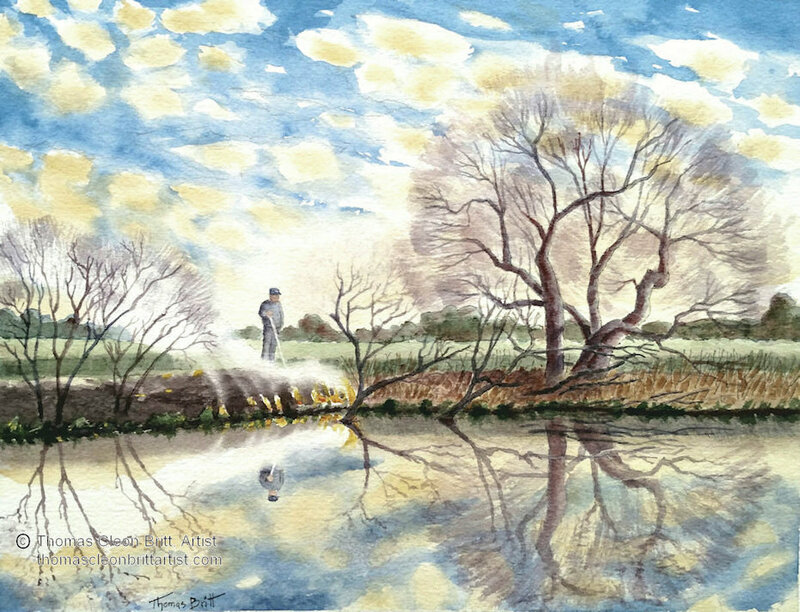 His favorite subjects are farms and farming equipment, animals, people, landscapes, and seascapes. Tom is a self-taught painter, so the foundation of his painting is his drawing ability, learned trough a life-long hobby of sketching and drawing in pencil, and through his architectural education and career. His primary influences include the classic adventure book illustrators of the early twentieth century, the landscape paintings of John Pike and Jamie Wyeth, and the art books of Edgar Whitney, Mary Whyte, and many others. Tom also plays the five-string banjo, and occasionally builds musical instruments. Original framed or unframed art work is available for purchase for the price listed under each image. Prices for giclée prints (high-quality, archival reproductions) are also listed below each image. To purchase a painting, or a print, please fill out the "Contact Form" below, and be sure to include the title of the painting or print. Also, if you would like to be on my email list, to be informed about new postings, please indicate this in the "Contact Form" below. My goal is to post a new painting at least every week.